I’m always trying to use what I already have on hand in the cabinets, and surprisingly enough, that’s how this recipe came to be. 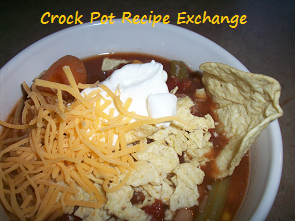 When I got this recipe started in the crock pot I was just sure I had OVER filled the crock pot. I let it keep cooking and kept an eye on it and it turned out just fine. As a matter of fact, it turned out so fine that we ate it two nights in a row. It was a HUGE hit. As most things cooked in the crock pot, it was even better the second night. Everyone ate seconds and a couple even ate thirds. Drain the dry beans and rinse well. Put everything into a 6 quart or larger crock pot. Cook on HIGH for 8 – 10 hours. Serve with tortilla chips, sour cream and grated cheese. I also made Mexican cornbread muffins to serve with this soup on the second night. We definitely will be making this again and again throughout the cold months. You could use canned beans in place of the dry. One cup of dried beans approximately equals a 15 ounce can of beans. 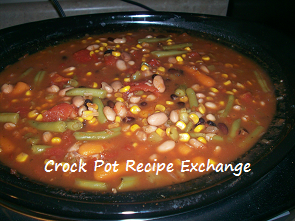 If you use canned beans you can cut your cook time and or temperature. 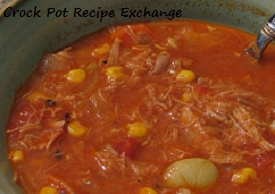 You could also cook this on low, but if using dry beans would increase the cook time dramatically. I mixed a packet (1 ounce) of dry ranch dressing mix with a container of sour cream to top this with. It cut the slight heat from the chiles and spices perfectly. 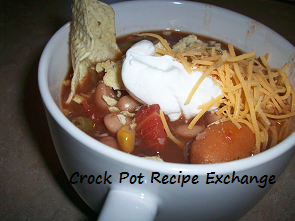 See Crock Pot Bean and Veggie Taco Soup on Key Ingredient.